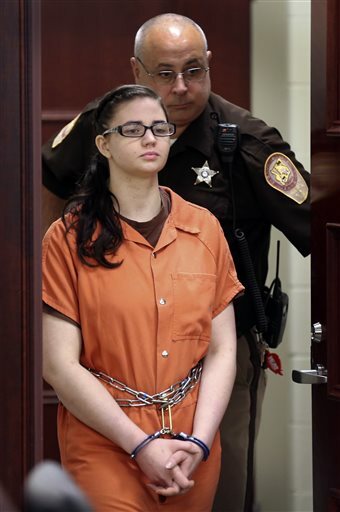 CHRISTIANSBURG, Va. (AP) — A former Virginia Tech student and Corps of Cadets member was sentenced to 45 years in prison for the 2014 killing of a fellow student. The Roanoke Times (http://bit.ly/1GiuHs7 ) reports Judge Robert Turk sentenced Jessica Michelle Ewing to 80 years for first-degree murder in the death of Samanata Shrestha. Court documents say Ewing’s sentence will be suspended in 2060 and she’ll be put on probation for 20 years after her release. Ewing was accused of killing Shrestha in February 2014 when the two planned a “date night.” In court, Ewing testified she strangled Shrestha with a chokehold. Shrestha’s body was found in the back seat of her Mercedes. In Monday’s testimony, Ewing says she dealt with depression. Tags: Christiansburg, Former Virginia Tech Student, Jessica Michelle Ewing, The Roanoke Times, Virginia. Bookmark the permalink.